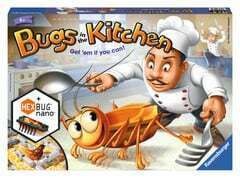 Bugs in the Kitchen from Ravensburger is a fun, exciting, fast paced game where the momentum never stops until the Hexbug is caught in one of the four traps at the edge of the board. The game is aimed at ages 6+ and can have from 2 to 4 players. Inside the box is the game board and a couple of bags of pieces which require assembly to complete the board ready for play, but it’s simple and once done, fits back in the box fully assembled ready for the next time you play. 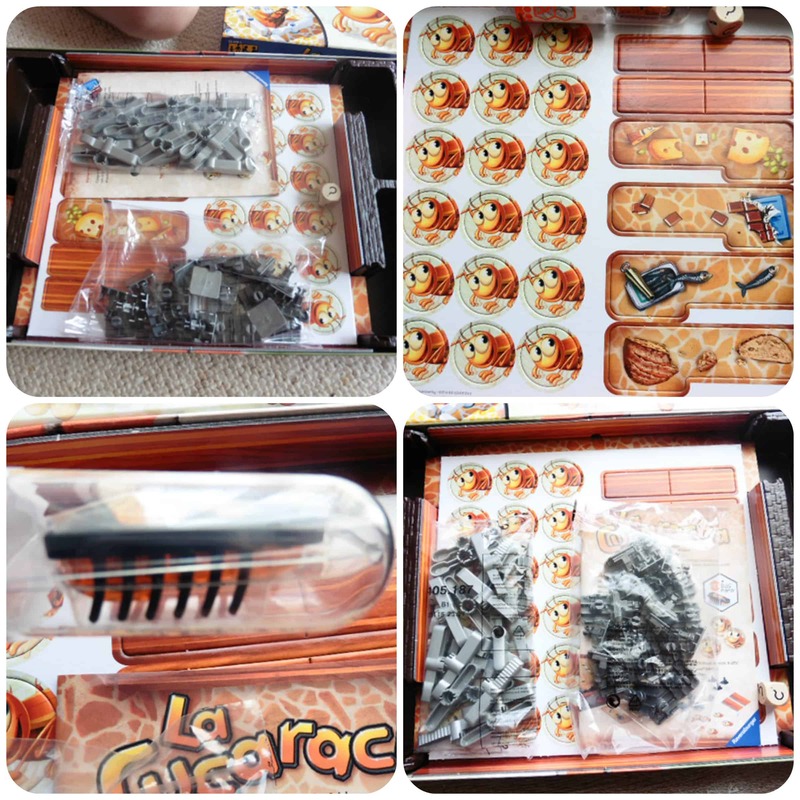 The board consists of the main part where the action happens, which has moveable cutlery pieces and four traps at the edges, a chocolate, fish, bread and cheese trap. There is a wooden dice and the highlight of the game, a Hexbug cockroach!! The Hexbug comes with battery included and my children were both eager to take it out of it’s tube and watch it scuttle, but being a mean mum I made them wait until we were ready to begin. There were also a sheet of high quality cardboard cockroach token’s that needed punching out and these are the reward if the cockroach landed in your trap. So as you’ve gathered by now, the object of the game is for the Hexbug cockroach to land in your trap, which results in you getting a token, and after you have won five of these tokens you are declared the winner. The board is set up as a maze with three suggested patterns to start as shown below by simply turning the cutlery accordingly. The game play is for players to take turns to roll the dice. The dice is wooden and a lovely chunky size with symbols on the sides to include a knife, fork, spoon and question marks. If you roll a piece of cutlery you must turn the relevant piece, although if you roll a question mark you can turn any piece of cutlery of your choice. 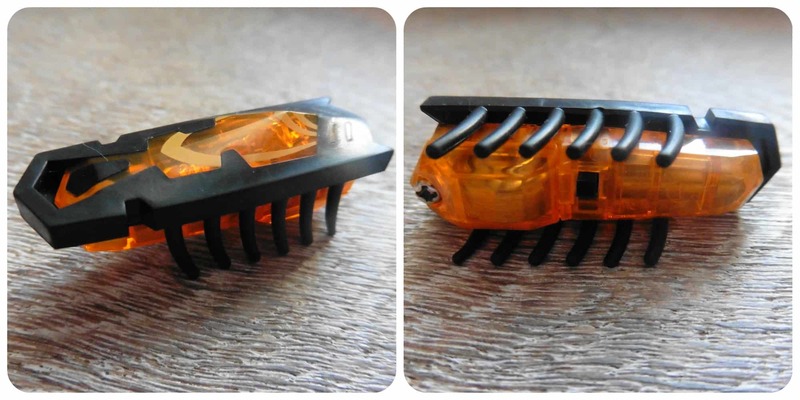 The idea is to turn pieces of cutlery to allow the Hexbug to reach your trap by turning the necessary pieces of cutlery to allow it through! They are so eager to get the Hexbug in to their trap that this game is fast paced and causes a frenzy of excitement. It is perfect for family fun and we’ve all sat and played it which has proved great entertainment for us all at any age. Obviously there is some strategy needed to turn the correct cutlery to open the maze up for the Hexbug to go in the direction you want, but my youngest who’s four and a half managed this quite well and loved playing just as much as my seven year old. This game has proved a great hit with us, and one they love to show their friends, and even got the grandparents playing! 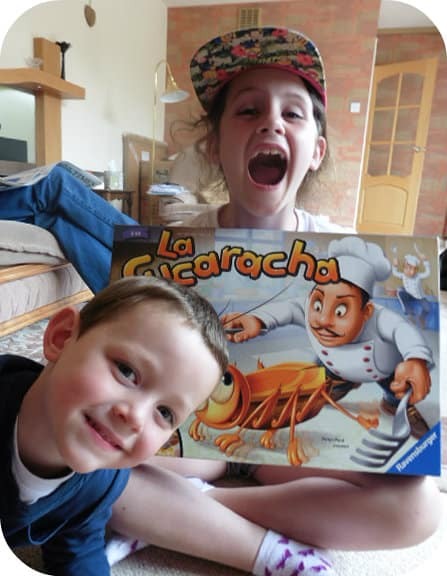 For some energetic, interactive board game fun, then Bugs in the Kitchen is the game to get! 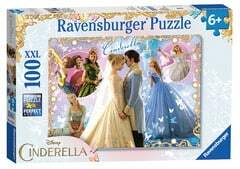 The Disney Cinderella puzzle from Ravensburger is a beautiful puzzle depicting the various outfits of Cinderella along with her fairy godmother and ugly sisters, aimed at children 6+. Miss M’s eyes lit up when she saw the puzzle and couldn’t wait to give it a try. 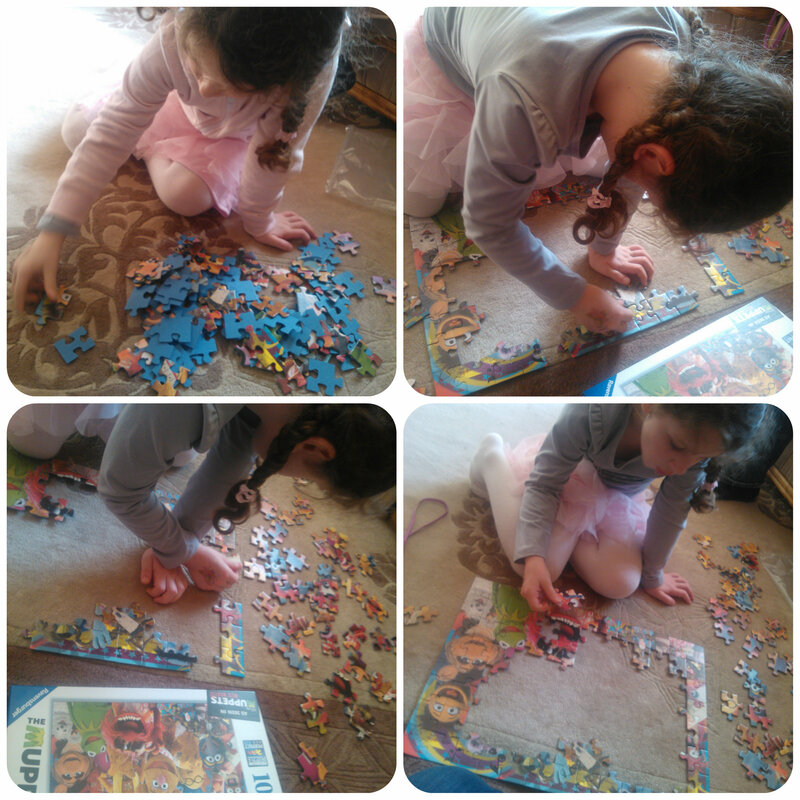 Having turned 7yrs old at the start of the year I was keen to see how well she could do this puzzle herself. 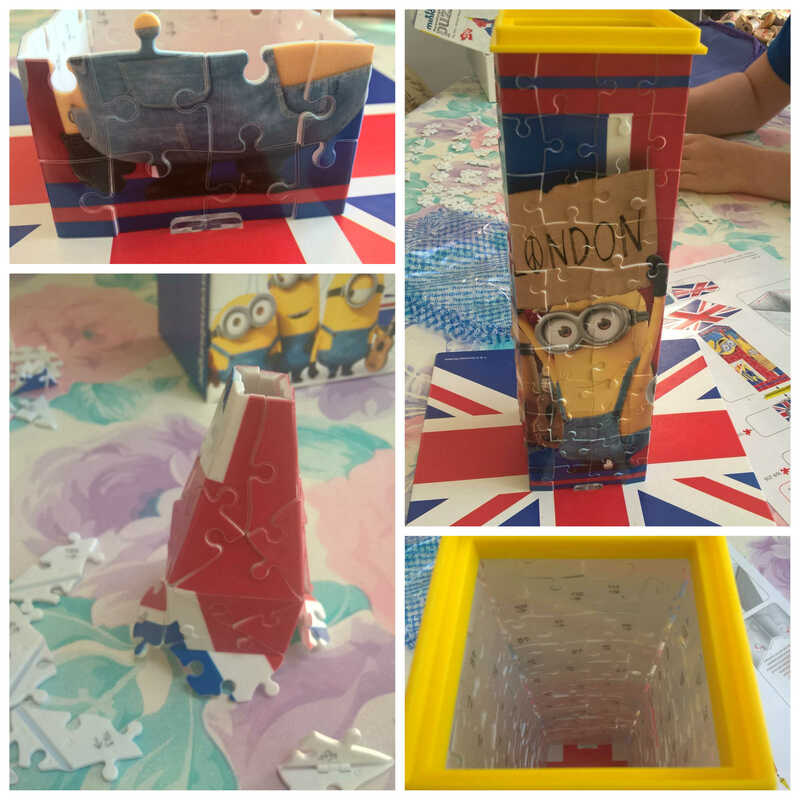 She began and with a few prompts from me to search for the edges and corners first, I let her do the entire puzzle herself which gave her a great sense of achievement on completion. The puzzle pieces are nicely cut and a good size for her age. With different characters and outfits to look for, it helped make the puzzle a little easier to do. She soon got into the swing of it and started finding the pieces she needed and getting excited when she recognised what area of the puzzle pieces came from. 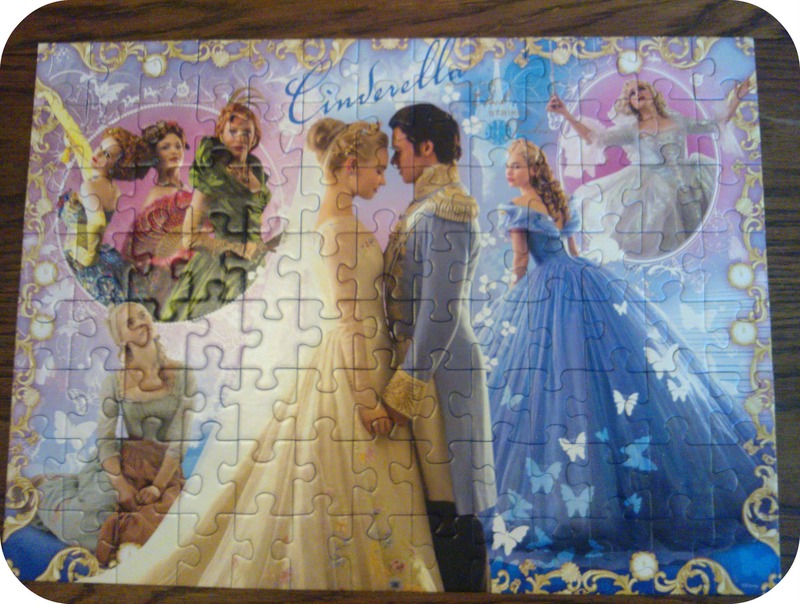 The finished Cinderella puzzle looked beautiful and coincides perfectly with the film Cinderella that has just been released. The puzzle has lots of detail but is perfectly suitable to the age group suggested. 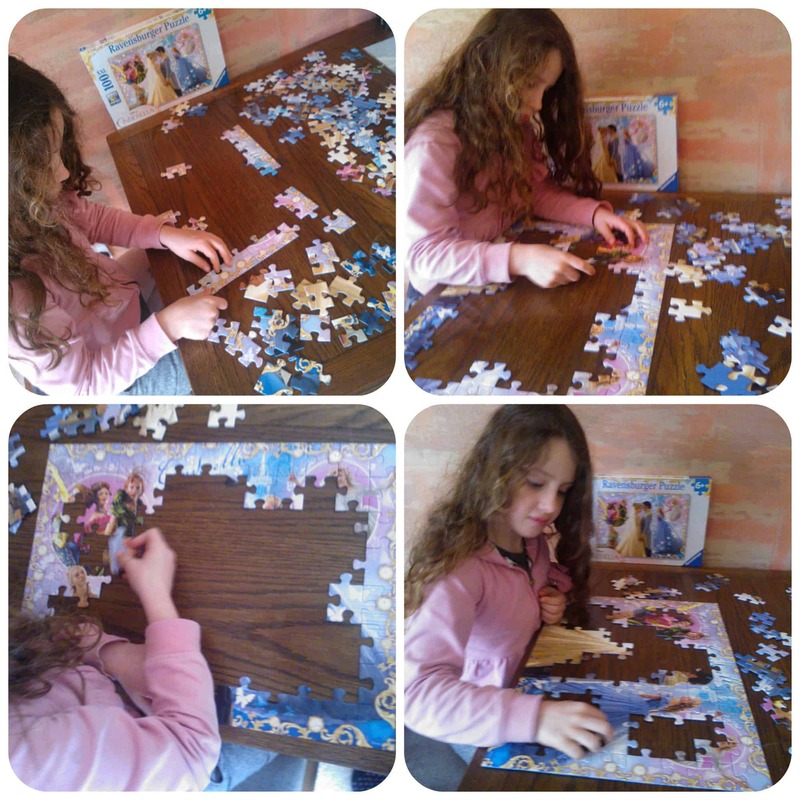 Miss M really enjoyed sitting, completing the puzzle and with a little determination, did it all by herself! 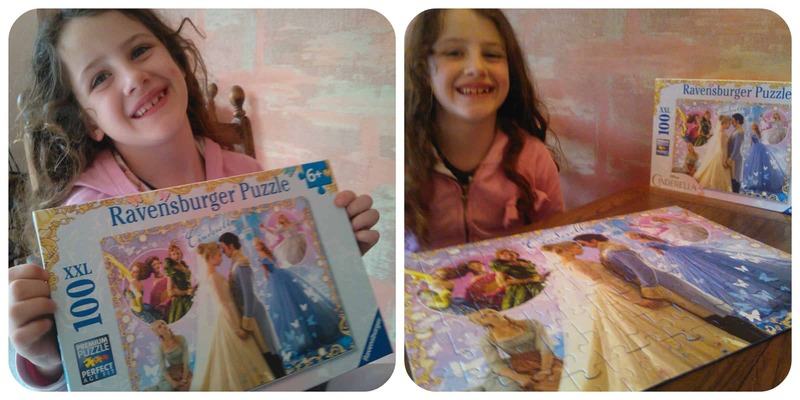 All reviews are my own and my family’s opinions and we received the Cinderella puzzle in order to write the review. Disney Planes 2 is the perfect theme for some new puzzles from Ravensburger with the new film being released this summer. Young fans of Disney Planes will love creating puzzles out of their favourite plane characters and Mister B is no exception. 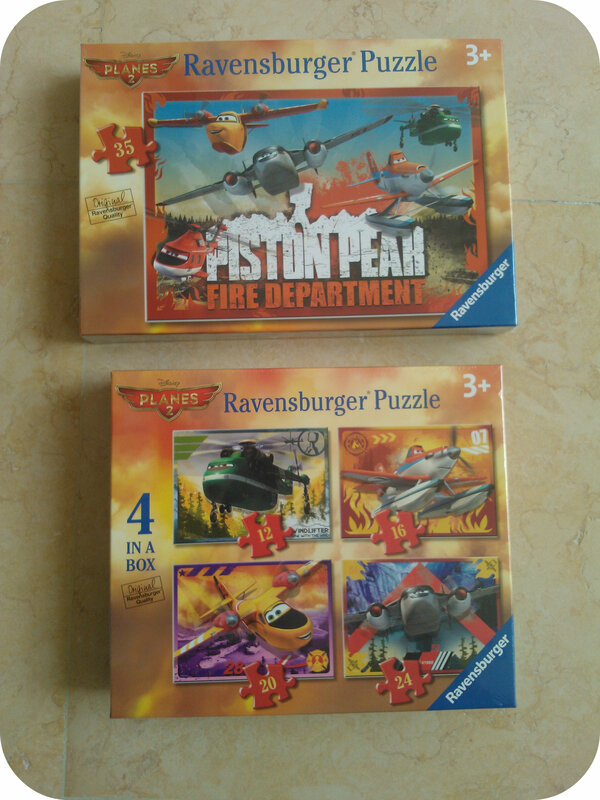 Being 3yrs old (nearer 4), these puzzles are just the right size for him without him losing too much concentration. We received a 4 in a box puzzle set with four puzzles of varying sizes. 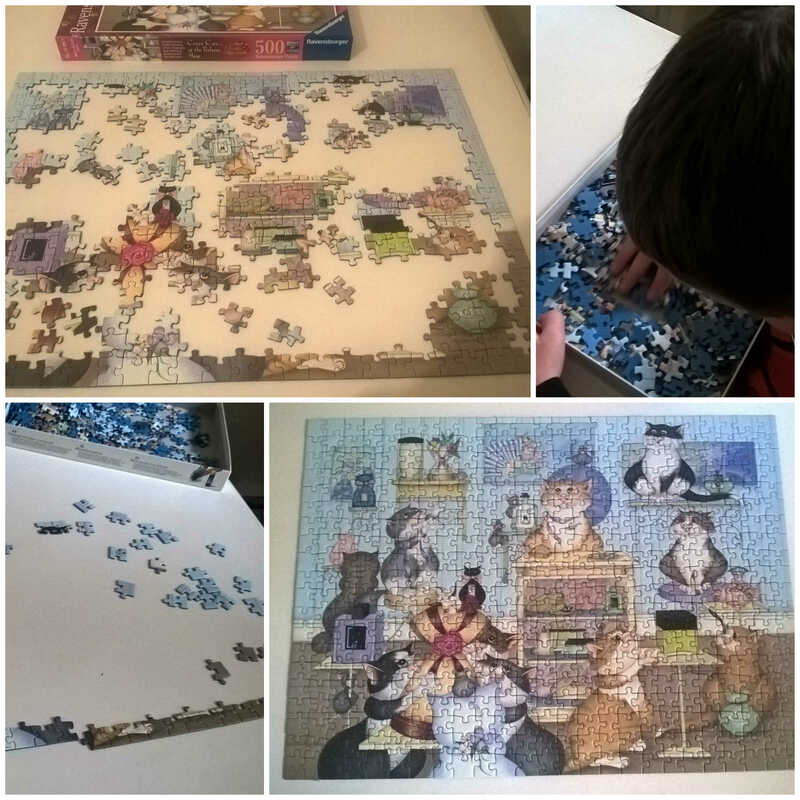 A 12, 16, 20 and 24 piece puzzle was included, each with a picture of a different character. Mister B started on the smallest 12 piece puzzle. This was the most excited I’ve seen him at attempting puzzles and it was really nice to see a smile on his face whilst doing them. I don’t know if it was the pictures that attracted him or the fact that he is a little bit older than when we’ve tried puzzles in the past. He was really determined to complete each puzzle and with a few pointers from me to find the corners, then the straight edges, he managed to get to the end. I think this is a great little set that we really enjoyed and as his confidence grew completing the smaller puzzles, he happily moved onto the larger ones. My one criticism of this set is that all four puzzles come in one bag, and all the backs of them are the same. It takes a while to sort the pieces out to separate the puzzles which was frustrating for Mister B to wait for me to do. We do have some other Ravensburger puzzles with different designs on the back, spots, stripes etc and I would have liked to see that in this box to aid little ones in finding the right pieces for each puzzle. Once Mister B had completed the 4 in a box puzzles we moved onto the 35 piece puzzle. Mister B was keen for the challenge but he did need a little help from me. 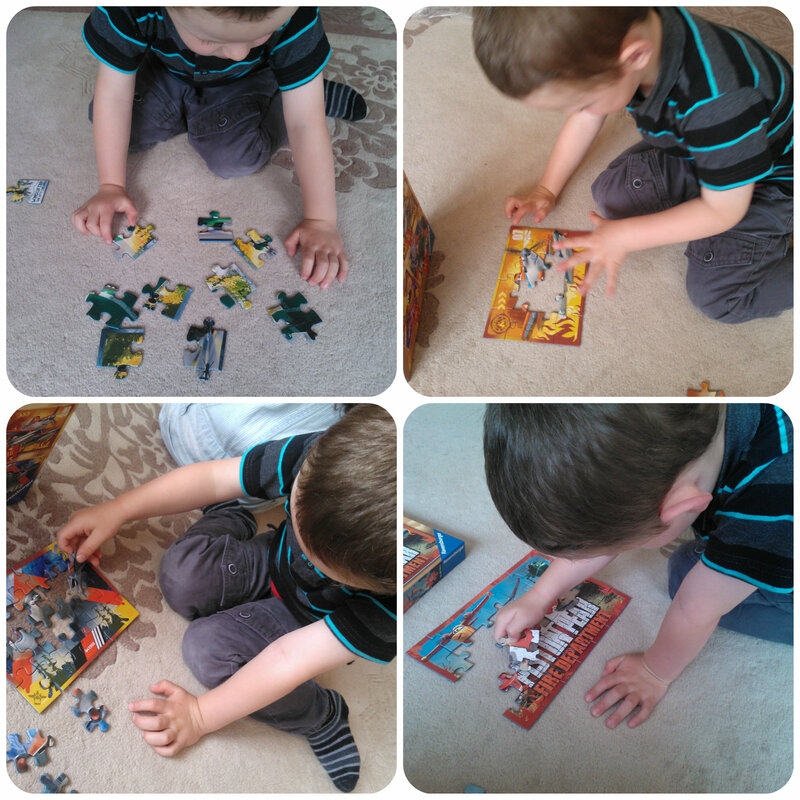 This is great practise for him though and it was fun to sit and guide him through how to put a puzzle together. We finally completed it and he was so proud at putting the last few pieces in all by himself, hopefully he’ll be doing it all on his own before long! We really enjoyed these puzzles and they’ve been great for Mister B to build on his jigsaw building skills. He loved the Disney Planes 2 theme of the puzzles too and I think he’ll have a lot of fun doing them over and over throughout the next year. 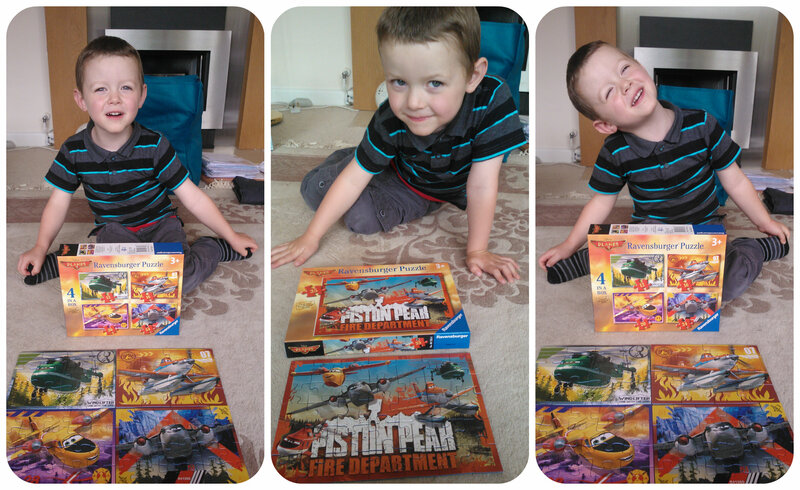 We think any little Disney Planes 2 fan would enjoy them too so why not check them out? All reviews are my own and my family’s opinions and the puzzles were sent to us in order to write the review. 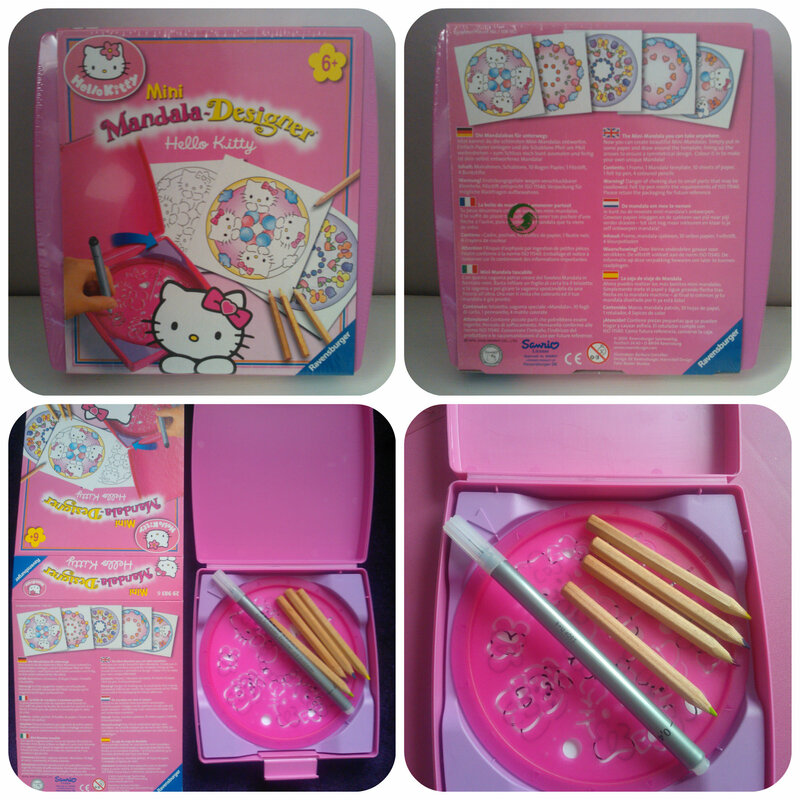 Hello Kitty Mandala Designer from Ravensburger is a stencil kit aimed at children aged 6+, to create Hello Kitty mandala designs. It comes in a small pink box that clips shut and I was impressed that this holds the stencil template, paper squares, the pen and colouring pencils. This makes it a great little kit for taking out with you or away on holiday. The stencil works by ensuring an arrow is matched on the circle stencil to the arrow on the frame and draw through the stencil a couple of images of your choice. Then turn the stencil by either 1, 2 or 4 arrows forward and repeat your image. By the time the stencil has come full circle you will have a complete circular image of designs. Miss M who is 6, is the perfect age to start creating these designs. She needed some initial pointers as to turning the stencil in even increments but once she got the hang of it she sat quite happily creating designs on her own. She even added some freehand drawing to her designs to finish them off before colouring them in. I think it’s really nice that you can create not only your own designs, but you then have something to colour in. You can use the finished designs for lots of things, maybe add them to a homemade birthday card, cut them out and hang them up along a piece of string as some bunting or just have fun with them. The Hello Kitty Mandala has really kept Miss M occupied on her own and I think it’s a great little set that she can easily pop in her bag and take with her. The plastic case and stencil are well made and the pen and coloured pencils that are included are also of a good quality. This would make a lovely gift for a girl and something that can be used again and again. All you need to do is cut some little squares of paper up to fit underneath the stencil and you can make endless designs. 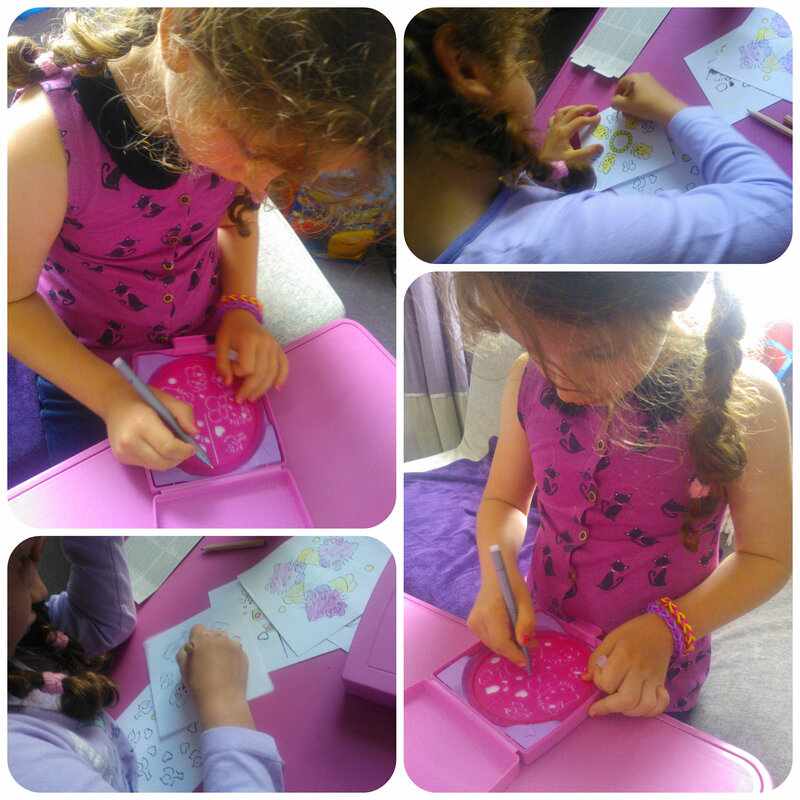 We’ve really enjoyed trying out the Hello Kitty Mandala and think it’s a fun way to stencil. It’s keeps a child occupied on their own and the designs don’t take too long to do, which keeps them motivated to see the finished result. If you’d like to hear more about the Hello Kitty Mandala as well as other Mandala and craft kits from Ravensburger, then why not join their twitter party on Wednesday 28th May from 1pm – 2.40pm. Use the hashtag #Getcrafty and make sure to follow @Ravensburgerpc who will be hosting. See you there! 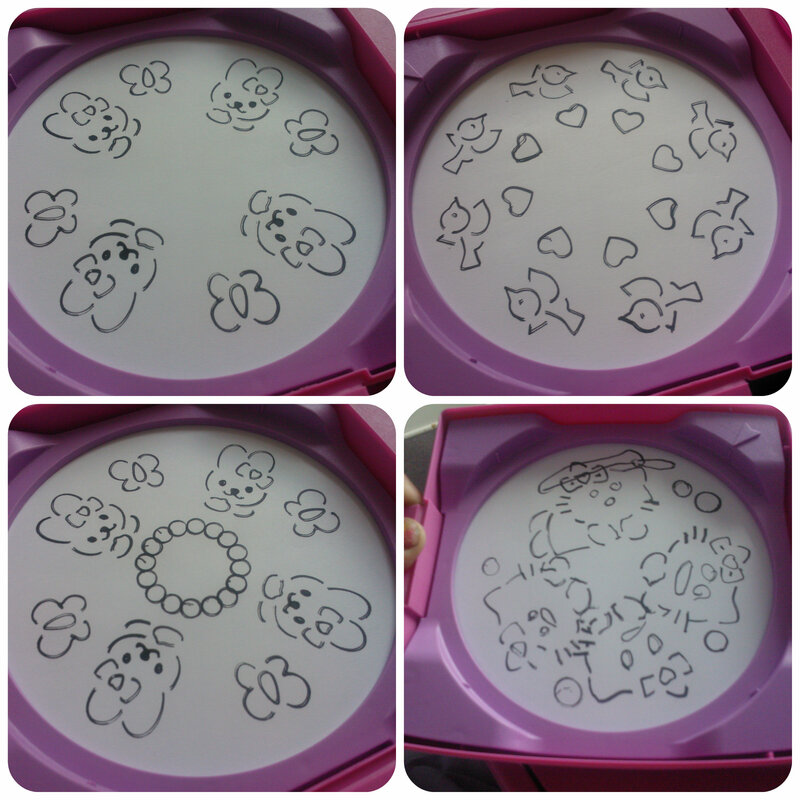 All reviews are my own and my family’s opinions and we received the Hello Kitty Mandala in order to write the review. The Muppets puzzle by Ravensburger is designed for children of the age 6+, perfect for Miss M to try as she was 6 in January. 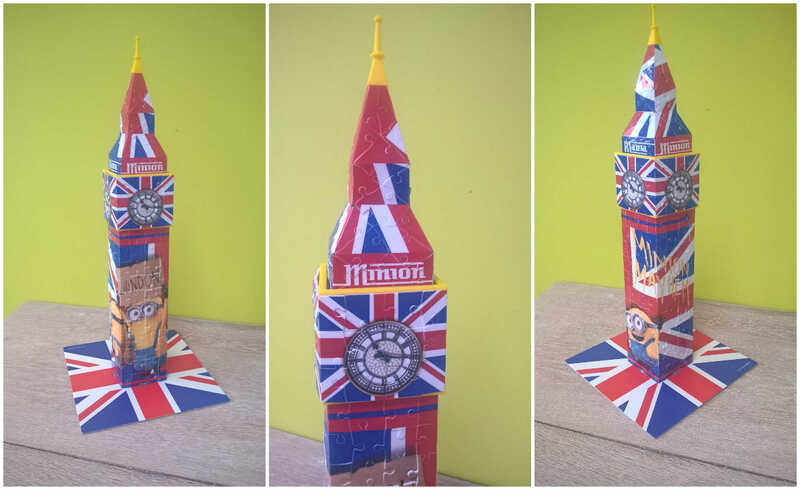 The pieces are fairly large making this a good sized finished puzzle at 49×36 cm. The puzzle contains 100 pieces making the biggest puzzle Miss M has attempted to date, but also allows her to be a little challenged and make her think a bit more. 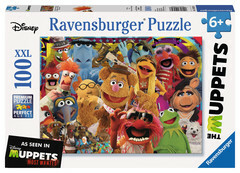 The theme of the puzzle, The Muppets, coincides with the release of the new Muppets film and is an image of all the Muppets together. The Muppets are something I grew up watching and always was a fan of Miss Piggy. Miss M was quite unfamiliar with the characters but it was a great opportunity to teach her their names. She found most of them quite funny as she pointed out their quirky features and bright colours. We tipped the puzzle out and I guided Miss M to separate the edge pieces from the middle ones and then we began to create the border of the puzzle. I thought she did really well, although I did give her a little assistance on the outside of the puzzle to get her going. I was really pleased to see Miss M getting totally engrossed in completing the inner part of the puzzle her self. When she got a bit stuck, I prompted her by pointing out an obvious feature on the box to look out for which got us talking about The Muppets. 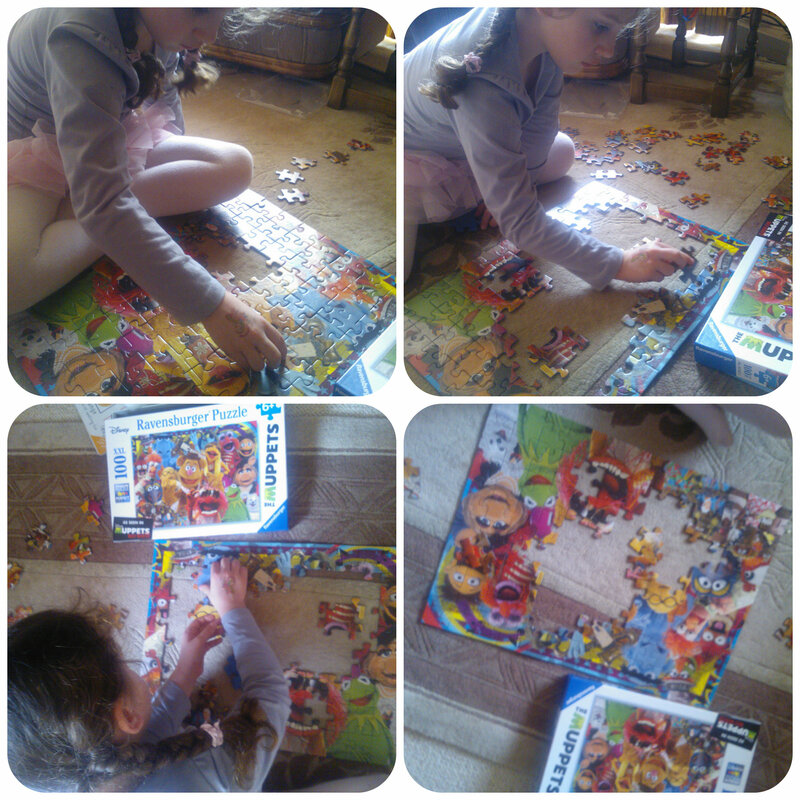 She kept herself motivated and eventually finished the whole puzzle which she was so happy about! 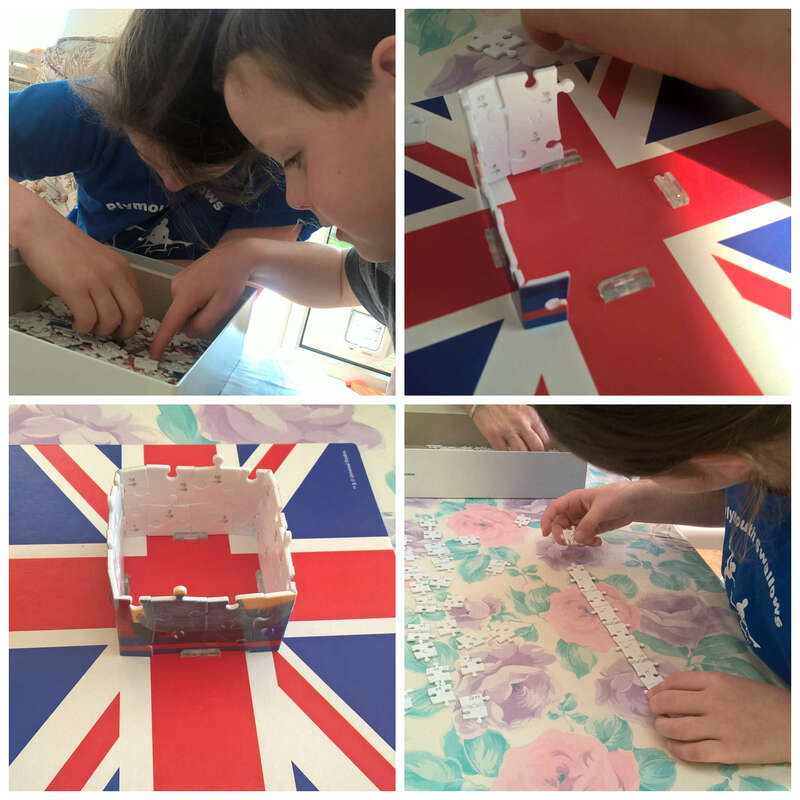 I think this is the perfect size of puzzle for a 6 year old as they can just about complete it with minimal assistance and a little guidance, which gives them the satisfaction of doing it themselves but also have a little bit of a challenge. I like the way Ravensburger grade their puzzles by age and size of the puzzle pieces. 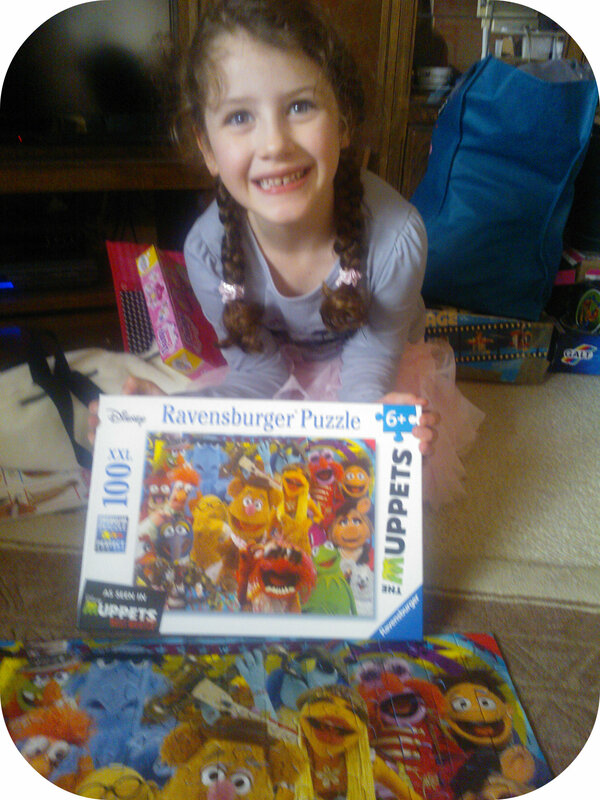 Miss M loved completing The Muppets puzzle and it has given her some knowledge of the characters. I think this is a great activity for children to do, that can be done again and again.